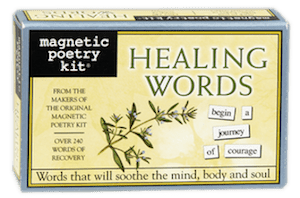 Tap into the positive and encouraging power of the healing process with this collection of magnetic words like change, dream, grace, peace, recover, spirit and transform. Kit contains over 200 themed magnetic word tiles. Tile height is .375" and package size is 4.75w x 3h x 1.25"d.